Sometimes you might need to read a short story into the microphone and use a beautiful melody as background for it, or you recorded yourself playing the piano and would like to leave some notes within the created audio file. 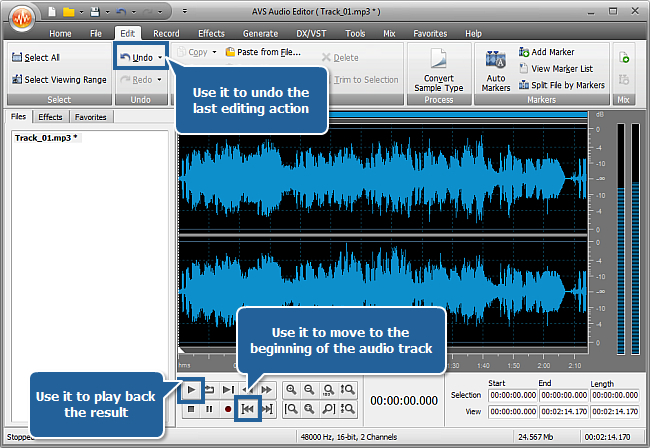 All that you can easily do using the AVS Audio Editor program. First of all run AVS Audio Editor. To do that find the corresponding program icon on your desktop and double-click it. If you unchecked the Create desktop icon box during the installation, you can run the program from the Start menu. 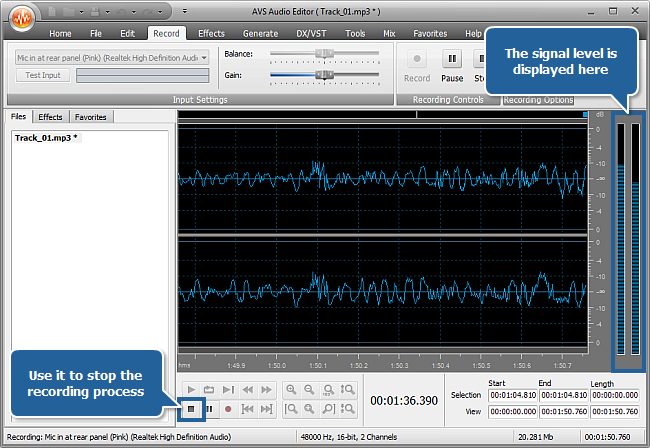 Please follow Start > All Programs > AVS4YOU > Audio > AVS Audio Editor. After the program was launched, click the upper area of the Open... button. 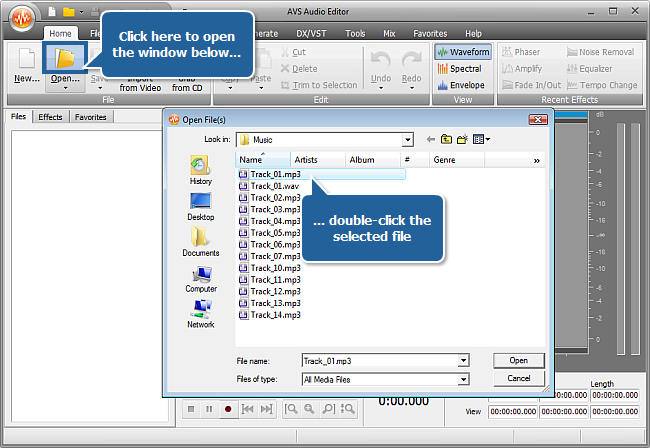 The Open File(s) window will pop up to let you browse for the needed audio file. As soon as you find it, double-click the file and it will be loaded into the program. 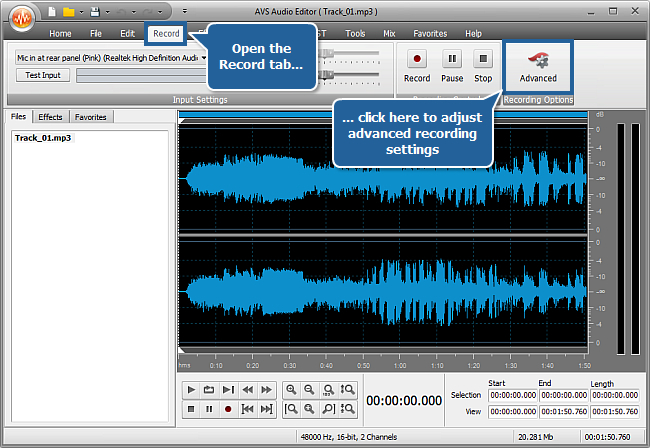 As soon as the audio file is loaded, open the Record tab to be able to adjust recording settings. 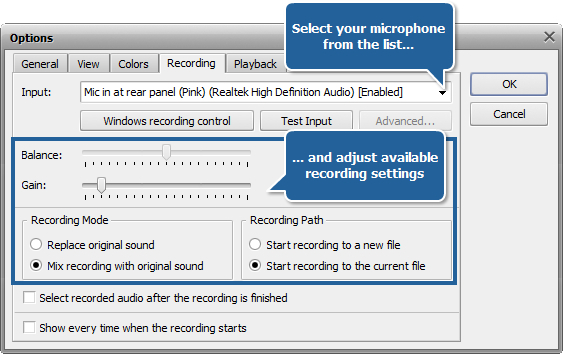 Recording Path - specify the file where the recorded audio will be saved to. As you need to add your recording into the existing file select the Start recording to the current file option. Now you can begin recording your voice. 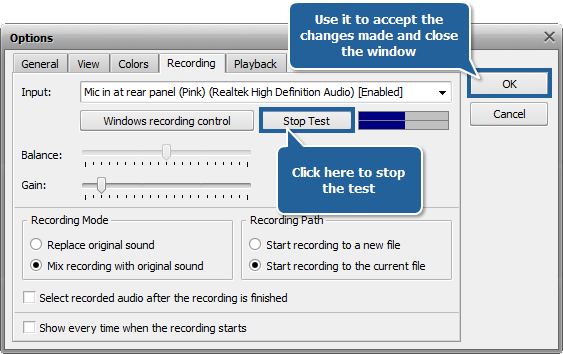 To do that click the Start the recording button at the bottom of the program window. The recording process will begin. The Volume Indicators on the right display whether or not the level of the signal coming from your microphone is strong enough during recording. Now you can play back the resulting audio file. To do that click the Go to Previous Marker button to play back the audio track from the very beginning and then press the Play button. If you are not satisfied with the result, you can click the Undo button situated at the Edit tab to undo the last editing action. That's all! 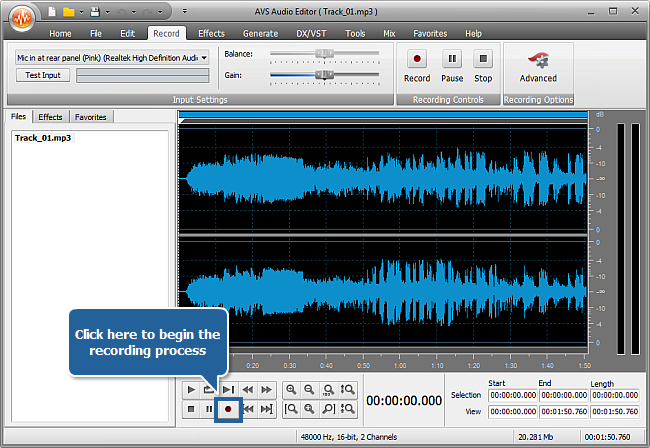 So easily you can record your voice over the selected audio track.